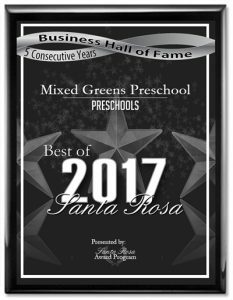 Welcome to Mixed Greens, a mixed age, green thinking preschool providing a fun, engaging, nurturing and constantly evolving environment for children ages 2-6. We’re so glad that you stopped by. Take a look around and if you have any questions, please let us know! at the beginning of life. Spring is in the air and the children’s minds are blossoming beautifully right alongside our rainbows of flowers! We excitedly greet this Green season of growth and discovery as we learn and play together! To see what we’ve been getting into lately, click here to access our blog!